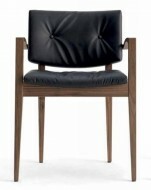 The Eileen High Back Lounge Chair is made of a Beech frame polished to Factory Wood stain. Foot Stool available to compliment. Family consists of High Stool, Armchair, Side Chair & Foot Stool.